Looking to re-energize your legal career, increase your marketability or boost your earning potential in 2018? In this episode of The Robert Half Legal Report, attorneys Charles Volkert, senior district president of Robert Half Legal and Billie Moliere, a district president with the company, discuss the latest hiring trends and the hottest practice areas driving demand for attorneys, paralegals and legal support professionals. They offer tips and proven strategies — including how to enhance your resume, build a professional brand, make a lateral move and boost your networking efforts — to jumpstart your legal career in a dynamic job market. Intro: Welcome to the Robert Half Legal Report, where we discuss current issues impacting the legal profession related to hiring, staff management and more, with leading experts in the field. Robert Half Legal provides lawyers, paralegals, and support staff to law firms and corporate legal departments on a project and full-time basis. The Robert Half Legal Report is here on the Legal Talk Network. Charles Volkert: Hello everyone and welcome. I am Charles Volkert, Senior District President of Robert Half Legal and the host of our program. Our guest today is Billie Moliere, District President at Robert Half Legal, where she provides skilled and practical guidance to legal clients and candidates. She is also an attorney with more than 10 years of experience practicing law. Billie, welcome to the show and maybe provide the audience some background on your expertise. Billie Moliere: Thank you so much Chad and it’s a pleasure to be here. I actually have been in the legal and staffing industry for over 20 years; about half of that time was spent as a practitioner, as an assistant attorney general where I was charged with overseeing regulatory affairs for gaming operations in the jurisdiction I practiced in. The last little over a decade I have been with Robert Half Legal in legal staffing providing strategic staffing and talent solutions for jobseekers and hiring managers in the Central US and Northeast. Charles Volkert: Excellent Billie. Well, I know our listeners will gain a ton of knowledge with your comments today and really look forward to our topic. Today Billie and I will be discussing a topic that legal professionals have likely asked themselves countless times, namely how can I spark my legal career? How can I build momentum to achieve my career goals? No matter how much we enjoy our current positions, these are common questions, ones we have all asked ourselves from time to time. Perhaps we want to increase our marketability or chances for overall advancement or enhance our earning potential. Certainly others look to take advantage of expanded avenues for career growth in the legal profession. Billie and I are going to discuss current hiring trends for lawyers, paralegals, as well as legal support staff and specialized skills that are in demand both in-house as well as within the law firm community. We will share proven strategies that can enhance your marketability and job options and offer other steps to help spark your legal career in the coming year. Billie, maybe to start, can you outline what we can expect on the overall legal employment front in 2018? Billie Moliere: Yeah. I think it’s pretty exciting news for job seekers and I would like to address this point by maybe speaking to the law firms and then to the corporate law department or in-house roles. I think what we are seeing as a trend in law firms is first and foremost increased hiring, so good news for job seekers of course. And it does appear that the midlevel lawyer appears to be very marketable in today’s environments. We are also seeing that experienced tech savvy legal professionals across the board, kind of the hybrid legal assistant who can perform a multitude of duties and stretch their skills, is very much in demand. In the in-house space or law department space, what we are seeing is a move to build internal teams, increase in-house teams, and so in-house roles in the areas of compliance, contracts managers, labor and employment seem to be in demand as well. And what’s notable and I think jobseekers or current employees will be happy to hear this, an assessment of starting salaries, 00:04:06 anything kind of ticks up in that area to make sure that in-house opportunities provide an opportunity to attract and retain top talent in today’s environment. Charles Volkert: That’s interesting Billie, because with all of this demand you are talking about we continue to hear from clients, both law firms as well as corporate clients the difficulty and challenge in finding highly skilled legal professionals in today’s work environment, ones with five plus years of experience. Can you share some additional thoughts on what do you think is behind that trend? Billie Moliere: Yeah. I think what’s happening is that they, meaning the hiring managers are experiencing a skills gap just as a result of the principles of supply and demand. There is just a lot of demand in certain practice areas and particular skill sets, five plus years, and the supply is not matching that demand. And so I think we have to look at those high practice areas that are driving this demand and I think employers have to determine the best way to attract talent for those. What we are seeing is that there’s significant demand in litigation, commercial law, real estate, regulatory and compliance related roles, healthcare and in litigation we are even seeing that in the next two years we can expect significant increases in insurance defense, commercial litigation, PI and labor and employment. So I think when you look at this the realities are, there’s just a lot of demand and the supply doesn’t necessarily match it, but the ways you get through that is identify the talent you need and what you may need to do to stretch to match the demand you have with the current pool of talent available. Charles Volkert: I couldn’t agree more Billie. I think that the hiring managers, no matter what level you are looking to hire at within a law firm or corporate legal department, need to continue to focus on what makes their organization unique, understanding that there is significant demand in the marketplace for many of the candidates that you have mentioned in those types of backgrounds, they need to move through the process quickly but effectively. They can’t sort of sit on their hands and hope that maybe they find somebody better or that the candidate they are interested in is going to be there or on the market for very long. And as you described Billie, there’s this increasing demand for experienced legal professionals. During the past several months it’s a factor that has definitely spurred the lateral employment market and this trend continues to gain momentum with many legal professionals who are taking advantage of the expanding opportunities that are out there. Can you offer some tips for those who are considering a move in how to spark their career and the next step in their career? Billie Moliere: Yes. And any move is exciting, but there is risk, and so I would just say the first step is to make sure you are planned and prepared before you make a move of course. And so part of that preparation and planning is to ask yourself, to do some self-reflection but kind of ask yourself, kind of a preliminary question, will this career move advance my career or be a stepping stone for my next career move, and will it advance or accentuate or enhance my job satisfaction. And then I suggest moving a little bit further and doing some homework. Truly do some due diligence on the organization or firm you may be seeking to move to, and think about in reality does this fit my intellectual needs, my cultural needs, things I want personally and things I want professionally. Consider your portable book of business, is there any conflict in terms of that. And if you are looking for things like leadership, does this offer an ability to move into that. If you are looking for other growth opportunities, how open is this environment to allowing me an opportunity to move. If the motivation is higher level work, is that available or is this kind of a one-dimensional role for me. And then, does this organization have a good track record for laterals, and if so, what is that, what does a good track record mean for them. And then, how does the organization integrate laterals. These are attorneys who have some experience in another environment and it’s pretty critical that maybe they were a fit somewhere else but are looking for another avenue, you want to make sure that’s a fit, and so what does that organization do to integrate them to make sure it’s a match on both sides. And I would just say last, but certainly not least, if you get past all that and you are at an offer stage and it’s time to negotiate compensation, you look at the full compensation package and that means cash comp and other compensation benefits and comp structure, but also non-monetary perks and incentives and also including training, integration, opportunities for reviews, things that people don’t necessarily think about when they are looking at pay, but they all connect in terms of your overall compensation. Charles Volkert: Great points Billie. It reminds me of the Association of Corporate Counsel Annual Meeting where Robert Half Legal was asked to provide career coaching and I know you participated in that, as did I and Jamy Sullivan, the Executive Director for Robert Half Legal, and a lot of what you just touched on we discussed with in that situation, in-house counsel that were thinking about their career and it really starts Billie with thinking about your career. Spending time on yourself, mapping out a strategy for the next two years, five years, what are your goals, what are your aspirations, what are you currently doing now that excites you that you’d like to do more of, maybe what you’re not being exposed to and thinking about your next opportunity, whether it’s in a law firm or within a corporation, these principles all apply; and I would say, legal professionals certainly consider ways to capitalize on expanding avenues for career growth. I don’t know if they spent enough time planning and thinking about that, and so, what steps should they take to maximize their success, Billie? Billie Moliere: Thanks. I think another good topic and it ties into what we just spoke about. This is another if you’ve got to be planned and prepared, and I think the thing that speaks most to what you can provide to an organization is that one piece of paper that most hiring managers see first and that’s your résumé. So, the first thing you should do is make sure your résumé is updated, refreshed and relevant, and appealing. And I think ways to do that or a lot of us who have been in an organization for a long time, a lot of legal professionals who are just looking to make a move potentially now because there’s so much demand, haven’t looked at our résumés in a long time. And so, what was relevant back then may not be relevant now or what was appealing then may not be what’s appealing now. So, I think the days, as you look at your résumé, the days of the old career objectives are gone, right, those tend to be perceived as self-serving statements versus a career summary, that is somewhat of a selling point in a mini cover letter that kicks off your résumé. And so that will be my first tip, kind of nix the career objective, go with a career summary to kind of jumpstart the review of your résumé, and then make sure your experience is clear and in chronological order. I’d also make sure the résumé is strategic and customized for each job you’re applying for. We know general résumés don’t always speak to the strengths that may be relevant to a certain job as they’ve got a mirror, your skill set, so that they match that environment, they fill the fact that you are good for another organization in the particular role. I would also suggest citing actions. You took successes that you had in particular roles as you’re citing your experience and then make sure all things on the résumé are clear, concise, format is and design is as well. The last thing I would mention is I would set up a professional networking profile on maybe a social media platform such as LinkedIn. We know that employers will tend to make an online research effort as they are vetting candidates for any job so you’d like that to match what they see in front of them in terms of the résumé. And then last certainly not least, continue to update that résumé and that profile, all the time and often. Charles Volkert: Excellent tips, Billie, and would you agree as you mentioned LinkedIn as you’re setting up that social network profile, you really need to follow the best practices you described as far as your résumé clear, concise to the point in that social media profile. Billie Moliere: Absolutely, and make it relevant and appealing. Charles Volkert: Excellent. Well, it’s been a very good discussion thus far; now, it’s time for a quick break. Advertiser: To find, hire and retain the best legal professionals, it’s critical to have a sound hiring strategy in place. Robert Half Legal works with law firms and corporate legal departments to create effective staffing plans that can adapt to changing workload levels, realize significant cost savings and improve the overall management of human resources. We offer a wide range of resources to assist hiring managers and job candidates, including our annual Salary Guide, industry-leading workplace research and valuable interactive tools. For more information, call us at 800-870-8367 or visit HYPERLINK “http://www.roberthalflegal.com” roberthalflegal.com. Charles Volkert: Welcome back to the Robert Half Legal report. I’m Chad Volkert and joining me today is Billie Moliere; District President with Robert Half Legal. We’ve been talking about how legal professionals can build momentum in the legal industry, in their legal career, in what is really a dynamic market today. And Billie, before we took a break, you were explaining why legal professionals should refresh their résumés if they’re planning to pursue new employment and career opportunities. What else is important for legal professionals in preparing themselves for a job change? Billie Moliere: Well, I think if you’re anticipating making a job change in today’s environment, it’s true that the environment is robust and active, and a nice place for a jobseeker, but it is also very competitive. And so, you have to ensure that your personal brand is also relevant and can help promote you. Your personal brand obviously defines and differentiates and promotes who you are and so what I would suggest is that a jobseeker be laser-focused on either developing their personal brand if they haven’t already, or strengthening their brand. And so, a few key things I would mention in doing that, the first thing is obviously again self-reflection; and so, thinking about who you think you are and what sets you apart, so you do that by assessing your legal skills, and your strengths and identifying any special abilities you may offer and thinking about your core values and your passions. I’d also consider one other thing as you’re doing this kind of assessment and reflection and that I’ll start with thinking about this quote, “Imitation is the best form of flattery.” My recommendation would be, think about someone that you admire in terms of a colleague and then look at their brand, and how they promote themselves, and look at what appeals to you and maybe what you could use to do the same for yourself. And after you do all of that, you merge all these factors together into your elevator pitch and that becomes your unique value proposition that you take with you to promote yourself as well. And so, you can continue to build and promote your brand by speaking engagements, continue to further your online presence and thought leadership articles, but I think it’s an ongoing thing that you continue to enhance and strengthen all the time. Charles Volkert: That’s great, Billie. There is a lot of great suggestions that you just made, there’s also tremendous material out there online as to branding yourself professionally. I know at Robert Half, we have Branding Yourself: 6 Tips for Professional Success that you can find on the Robert Half blog, but a lot of different resources out there, and so much to what you were talking about, Billie, I would encourage our listeners who are thinking about their brand, how we present ourselves, which again is different in the legal space than maybe some other professions. A lot of great examples out there, online, take a look at those and begin to model what you’re looking to achieve after some of the colleagues that are out there on social media. Can you offer some tips, Billie, on how legal professionals can leverage social media to enhance their networking efforts? Billie Moliere: Yeah, and I think it’s imperative to always network; particularly, if you are interested in moving your career in a different direction. So, online networking offers, I think this is something that’s pretty significant, an ability to connect with a vast number of business contacts and to rapidly develop new professional contacts, in a way that you just couldn’t without the expansive contacts that are available to you to kind of add a push of a button. And we mentioned LinkedIn earlier but a usual suspect in the area, right, that is a professional networking environment and we all hear about it, and probably, Chad, I would submit, you and I are on it and every other legal professional we connect with as well, and so that will be one I recommend; Facebook and Twitter or others. You can easily create profiles and you can easily connect with others quickly on those type of platforms. I’d also suggest doing more than that, stay active and robust on your engines, post things that are exciting about you that also continue to help you with your brand, join relevant groups on these social media platforms and participate in them. And then make sure you again keep your profile up-to-date and professional at all times, but you can continue to do that by posting things you do from a professional perspective as well. Charles Volkert: Excellent, Billie. One question that I’m frequently asked by legal professionals is how to best explore employment options in other locations around the country or even overseas; obviously a professional brand online profile and networking are all essential, as you mentioned, however what other considerations play a major role in successfully landing a position in a new city, here or Canada or abroad? Billie Moliere: Yeah, good question, and obviously research is going to be critical to making a move like that. And I think the first things these professionals should do is think about their own skill sets and if it’s kind of a toss up in terms of where you may be looking to go then what states or other countries, if you’re looking to go international, offer more opportunity that matches your particular background. I think you have to, and we’ve been talking about this tap deeply into your network, to gain knowledge about opportunities in particular areas, and you obviously want to use a national search firm if it’s a national search and an international search firm if it’s an international opportunity, you’re looking for it to expand your options. It’s always better, obviously, to have additional eyes on your search along with your own. And if you’re a lawyer and you’re seeking to practice you want to look at the Bar requirements in different jurisdictions, what would be required for you to enter that as a practitioner. More specifically, as it relates to overseas opportunities, we do see that opportunities that tend to always be in demand would be in international arbitration, corporate, commercial securities, capital markets, and M&A. But, I would again checkout requirements you would need if you’re looking to practice in another country, how easy it might be to satisfy those requirements, and if that’s something you’d be up to when you’re making a move, obviously, consider if there are any language capabilities that would be required and necessarily to be effective or able to perform a certain role. Charles Volkert: Yeah, I was going to jump in there on the language capabilities. Love Martindale-Hubbell, a lot of lawyers forget that they can actually search in Martindale-Hubbell under any city with the advanced search technique to identify lawyers in that city that speak a specific language. So, if you are looking at relocating and you have language capability, it’s a great way at least initially to network with other lawyers with that same language capability in a different market where you might be interested in moving to. Billie Moliere: That’s spot on, and I would just add to that also. You could look at firms that have a US operation and start tapping into who you know in the US operation to try to explore opportunities abroad as well. The other thing I would mention would be checking with the US Embassy in the country of your choice for advice and recommendations. And you want to make sure you’re considering any immigration, relocation, documentation, certification requirements. And then I just close again with use a search firm like a Robert Half, who’s got international presence who can help keep eyes on the market for you in addition to your own search. Charles Volkert: Great points, Billie. I would reference another great tool; the ALA has a Career Center. They actually have a number of articles that are featured with questions and answers for advice for lawyers and legal professionals contemplating relocation. So, again, a lot of information out there and getting some trusted recruiters on the ground in the market that you might be interested in is also very helpful as you mentioned, Billie. Well, unfortunately, it looks like we’ve reached the end of our program today. That was certainly a great discussion based on Billie’s wonderful insights; a big thank you, Billie, to you for joining us. Billie Moliere: Thank You, Chad. My pleasure. I really enjoy being here as well. Charles Volkert: Excellent. Well, before we close, I’d like to let the audience know how they can contact you and where they can obtain more information. Billie, I’ll turn it to you for your contact information. Billie Moliere: Yeah, I can be reached at HYPERLINK “mailto:[email protected]” [email protected]. Charles Volkert: Thank you, Billie, and I know you are very receptive to our listeners reaching out to you for additional information. Our listeners can reach me at HYPERLINK “mailto:[email protected]” [email protected], and you can also visit the Robert Half Legal website, HYPERLINK “http://www.roberthalflegal.com” roberthalflegal.com for additional information on legal career and management resources including our latest salary guide for the legal professionals. Thanks again, Billie, for providing just great insight today and to our audience for listening. 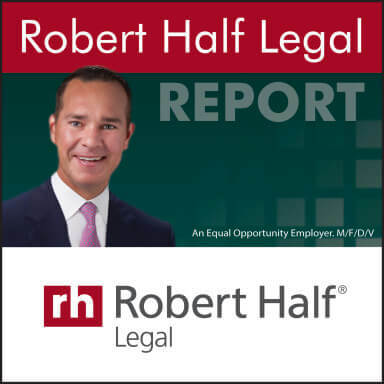 Join us next time on the Robert Half Legal Report as we discuss important trends impacting the legal field and legal careers. Outro: The views expressed by the participants of this program are their own and do not represent the views of, nor are they endorsed by Legal Talk Network, its officers, directors, employees, agents, representatives, shareholders, and subsidiaries. None of the content should be considered legal advice; as always consult a lawyer. Thanks for listening to this podcast. Robert Half Legal connects the most highly-skilled candidates with the best positions in the legal profession. Join us again for the latest information in the next edition of the Robert Half Legal Report here on the Legal Talk Network.